During the last fortnight of May, two really important events intersect on the Cote D’Azur: the Monaco Grand Prix and the Cannes Film Festival. These are sporting and cinema highlights, known world-wide with the presence of international artists, great sports names and VIPs, among them the international star, Lorena Baricalla. A noted multi-talented performer, being prima ballerina, actress and singer as well as choreographer and producer, Lorena is a figure of iconic elegance and often participates in big international events. MLM: What can you tell us about the Monaco Grand Prix? Lorena Baricalla: My roots are here in the Principality where my family has lived for more than 5 or 6 generations. On top of that, I was born on a day that the Gran Prix was taking place, so I think I can say that my love for this event is in my DNA! I have so many memories right from when I was a child and followed the race from the windows of the ‘Princess Grace Dance Academy’ where I was a pupil. I’ve seen a lot of great racing drivers win! The atmosphere is magical. Monaco changes totally in those days. It really and truly becomes a circuit, and living here, we practically experience the race from the inside. MLM: Which events did you take part in this year? 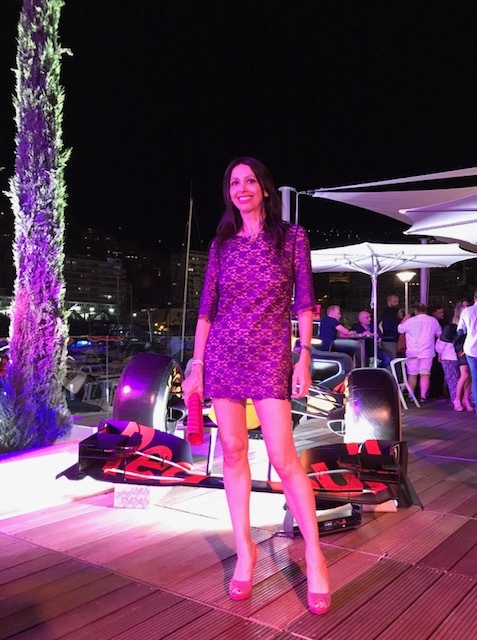 Lorena Baricalla: This year I was a guest at the exclusive Red Bull Party: a fantastic event with people from all over the world who had gathered here for the event, including many well-known photographers and journalists who follow all the 21 Formula 1 Grands Prix. The evening took place in a large structure on two levels which had been especially constructed in the Port of Monaco. It was decorated with F1 cars at the entrance and had a swimming pool, mega-screen and trendy lights and music. A dynamic atmosphere which I wanted to transmit over my social networks by sending live images, just as I did for the Cannes Film festival. MLM: How did this 2017 edition of the Festival go? Lorena Baricalla: The Cannes Film Festival is an extraordinary international cinema event and draws a crowd of onlookers. It’s a massive multi-coloured carnival. I’ve taken part many times, often with the American producer, Julius Nasso, who created all Steven Seagala’s films. This year I hoped to be joined by the great actor and friend Armand Assante, winner of the Golden Globe, but unfortunately he was held up on a set. In any case, as usual I had meetings and work appointments and I took part in the red carpet event for Roman Polanski’s film. MLM: What can you tell us about that experience? Lorena Baricalla: As usual, just before the event, I was assailed twice by numerous photographers and by tourists armed with cameras. It’s a situation that is part of the festival. Then the moment when you climb the steps on the red carpet is always magical and symbolic, the dream of many. I’m very lucky to have taken part in all of this. Roman Polanski, who I was able to see close up, never changes and never ages. He is always the same, and as usual, he has created an unusual and quirky film. Polanski is Polanski! MLM: Who was your stylist for this red carpet? 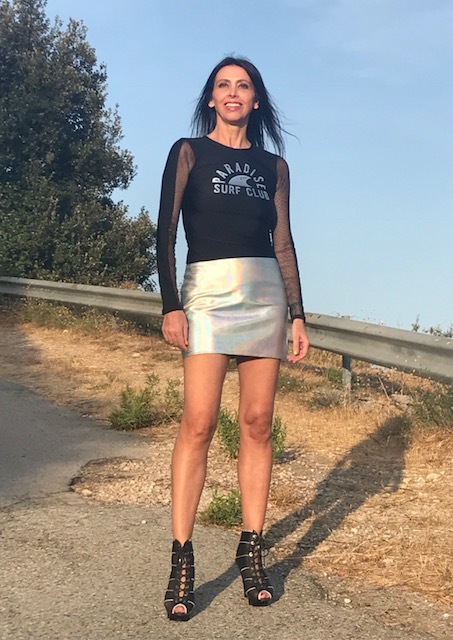 Lorena Baricalla: Yes, fashion came along quite by chance a while ago, in that as Master of Ceremonies I have presented big international events and often take part in red carpets and other events. As well, I have excellent relationships with stylists, jewellery creators, and shoe and accessory designers and I’ve worked with many firms. In addition, for all these events I’m followed by my hairdresser of choice, Daniele Rao. For me fashion is like a costume on the stage of life. That’s why, for the last evening of the Grand Prix I wore a dress in black and white chessboard checks, as a tribute to the race. MLM: Is it true that you are Ambassadress and Master of Ceremonies for the Monaco World Sports Legends Award? Lorena Baricalla: Exactly! And this is why I wore this chessboard dress to the Grand Prix this year. In fact, at the 1st Monaco World Sports Legends Award a few month ago, we awarded a special posthumous prize to the Monegasque, Anthony Noghes, creator of the Monaco Grand Prix and designer of the black and white checked flag which is used today in all the races around the world. This is an important fact which not everyone is aware of and which has been brought into the spotlight, thanks to this award. MLM: Can you tell us anything about up-coming events in Monaco? Lorena Baricalla: There will be plenty going on this week too. I’m going to take part in the inauguration of an exhibition, in the two days of Monaco Fashion Week, and at an event on 2nd June organised by the Italian Ambassador. I’ll let you know! Discover the backstage of Lorena's dressing room before a show!